I don’t know about you, but I’m ALWAYS eating. I eat constantly throughout the day and I never tire of it. I LOOOOVE food. I was chatting on Skype with my BFF a little while ago and I apologized for eating while we chatted and she said something to the tune of “you’re always eating when I talk to you” which made me realize how true that was. I still have memories of our phone conversations as teenagers, while we watched 90210, as I mooned over Dylan and munched on corn nuts (let me just say that loud crunching noise made by eating corn nuts is not so conducive to watching television…I would miss half the dialogue and BFF would spend the entire hour reciting it back to me). I promise I’ve changed my ways and chosen quieter snacks to munch on. The funny thing is, I’m at the healthiest and most fit weight that I’ve ever been in my adult life. It’s most certainly due to my super healthy and well-balanced diet. I was never obese, but I always felt like I had a little extra weight to lose, and now it’s gone. It melted away within 2 months of starting a macrobiotic diet and has stayed off ever since. That said, my foray into macrobiotics had nothing to do with weight loss and everything to do with seeking general good health and balance for a longer, healthier, more harmonious life. After all, the term macrobiotics comes from the Greek words “long life”. But I digress here. Let’s get back to snacking ;-). If you’ve read some of my other posts, then you know that I teach English communication to professionals in various companies across Milan. This means a lot of running around the city, hopping on and off trains, trams and buses. I try to have most of my meals at home to avoid the junk food parade out there but when that’s not possible, I pack a lunch and I ALWAYS carry snacks to munch on between lessons, to get me through to my next meal. How is a girl to survive without snacks? I never understood that unusual breed of people who could eat 3 meals a day and stop at that. I typically eat 6 times a day: breakfast, mid morning snack, lunch, afternoon snack, dinner (and sometimes a pre-dinner snack if dinner happens later). I did warn you…I LOOOOVE food. 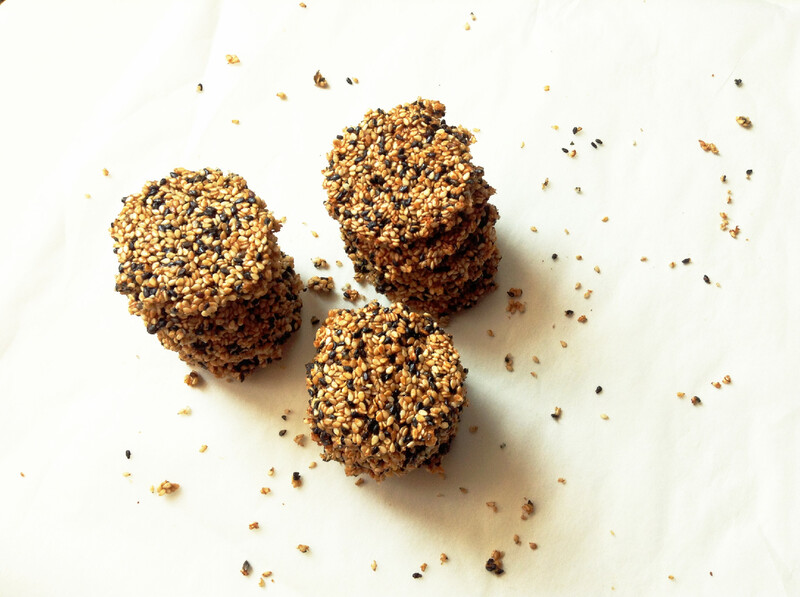 These Sesame Seaweed Snacks have become a part of said snack repertoire and are loaded with goodness; white and black sesame seeds, nori (seaweed used in making California rolls), tahini, sesame oil and barley malt. Sesame seeds in general are an excellent source of calcium, iron and Vitamin B to name just a few; black sesame seeds in particular are famous for their anti-aging effects, and their ability to reduce grey hair and improve skin tone; while Nori is rich in protein, dietary fiber and iron, not to mention a great source of Vitamin B12 for vegans. As I run through the list of health benefits, all I can think is that I have to find a way to mass produce these at home so that I never run out. That’s a lot of healing power packed into one little snack, and they’re tasty to boot, earning them the title of super healthy Super Hero Snacks! Here’s the recipe so you can give them a try for yourself. Combine sesame seeds in a mixing bowl. Tear up Nori into small 2 cm pieces and set aside. Combine malt, shoyu, sesame oil, and tahini in a small pot over medium heat and bring to a light boil for 2-3 minutes. Remove syrup mixture from heat and pour into a well in the center of the sesame seeds. Mix to combine and fold in nori pieces, a tablespoon at a time (if you add it all at once it will all clump together when it makes contact with the syrup mixture). Pour mixture onto a parchment paper lined baking sheet and press with a spatula to flatten. Place another piece of parchment paper over top and use a rolling pin to flatten the surface. Remove top piece of parchment paper and bake in a preheated oven for 20 minutes until edges are slightly golden brown. Baking time will vary based on your oven, make sure to check on them after 10 minutes to make sure they don’t burn. Remove from the oven and let cool for 2-3 minutes, then using a 2 inch round cookie cutter, cut out 16 crackers being extra careful not to burn your fingers. Transfer to a piece of parchment paper and let cool until firm to the touch. Break up remaining mixture into bit size pieces (pictured below). They will seem undone when you remove them from the oven because the syrup mixtures needs to cool for them to solidify and bind. If you want to cut the shapes out with a cookie cutter, be sure not to let the block cool and soldify completely otherwise it will be difficult to cut through. If you don’t want to bother using a cookie cutter, just let the block cool and solidify completely, then use your hands to break it up into pieces. You can also reduce the amount of sesame seeds and add pumpkin seeds, sunflower seeds, flax seeds or nuts. Just make sure the proportion of dry to wet ingredients stays the same. The amount of malt or rice syrup used will change the overall outcome. 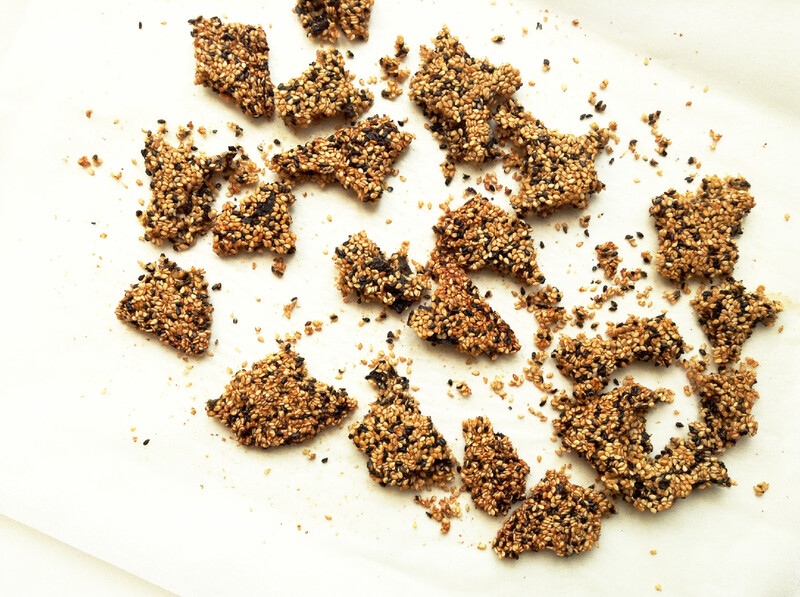 If you want a hard candy like texture (like sesame snaps), increase the amount of malt to 1/3 cup or more depending on how hard you want them. 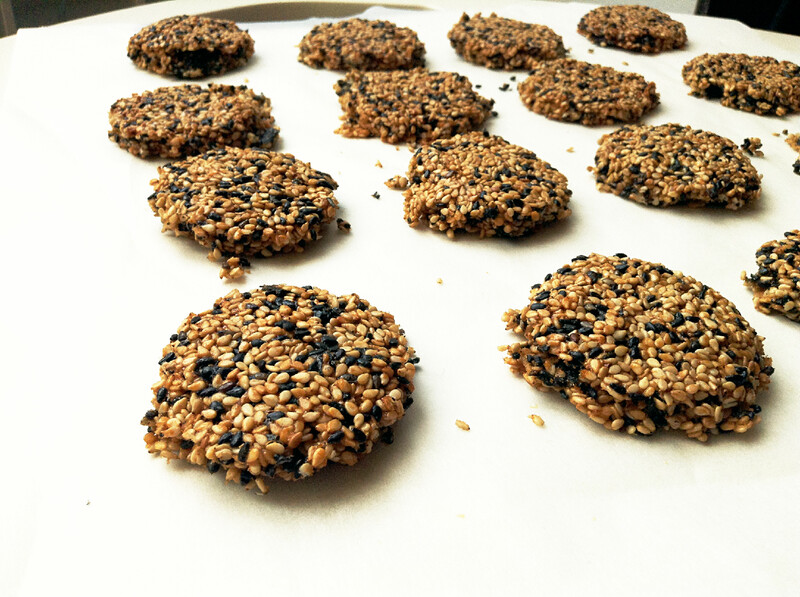 I wanted these to be softer than traditional sesame snaps, so 1/4 cup of malt was perfect. For more healthy homemade snack ideas, click here. 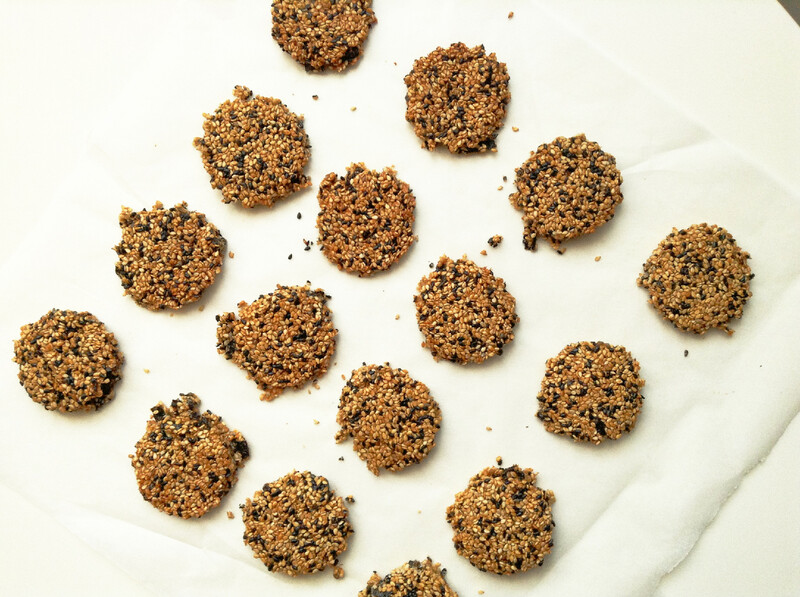 Now it’s time for a snack and these Sesame Seaweed Crackers are just what the Macrobiotic Counselor ordered :-).